A large amount of the energy that reaches earth from the sun is absorbed by the oceans of the world. It creates winds which drive vast ocean currents and make waves. This solar energy warms the waters of the oceans and adds water vapour to the air. The moon's gravity pulls our oceans towards it causing the sea to rise and fall twice a day. Winds, ocean current, and tides all contain huge amount of energy. Scientists across the world are experimenting with ways to turn this energy into power. 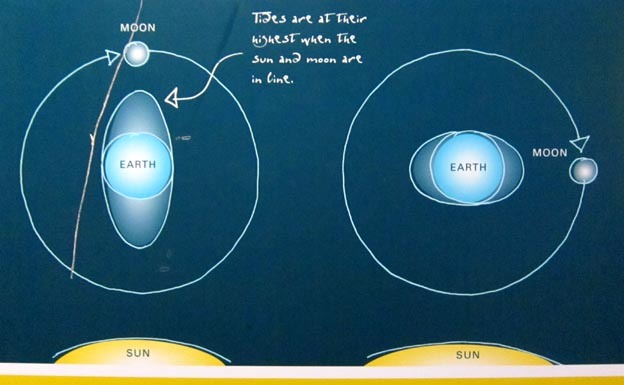 ＊　The moon's gravity pulls our oceans towards it causing the tides. The energy stored in our oceans is vital to the future of our planet. We can make use of this stored energy in many different ways, but first we have to find ways of releasing it. 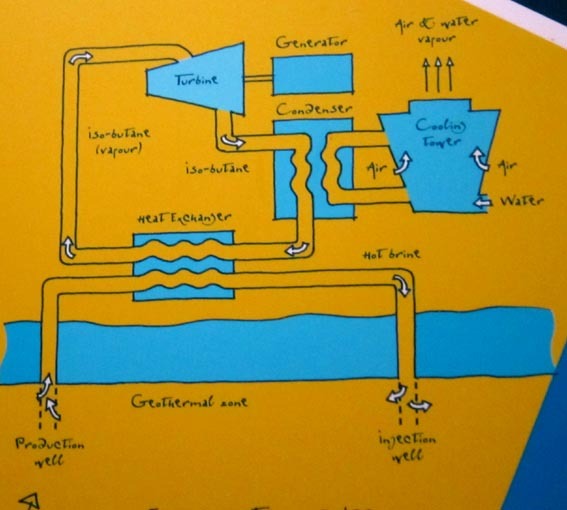 We must convert this fantastic ocean energy resource into useful OCEANPOWER. 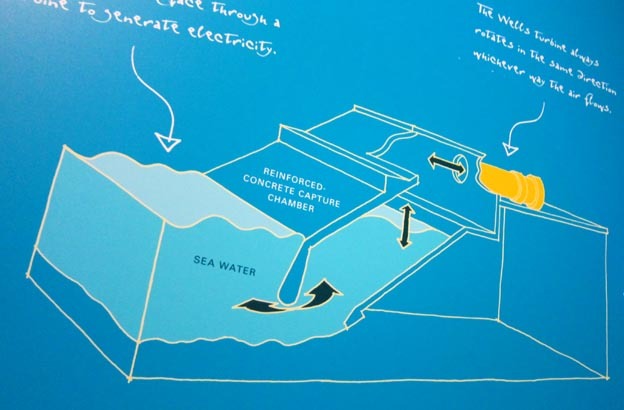 The easiest way to turn ocean energy into useful OCEANPOWER is to convert it into electricity. 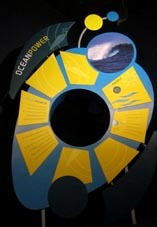 Almost all types of ocean and water power projects convert the energy into electricity. > The oceans of the world are constantly moving. > Heat from the oceans creates movements of air, from gentle offshore breezes to destructive hurricanes with winds of up to 360 km per hour. > These winds drive major surface ocean streams which bring cold water from the polar regions towards the tropics and warm water from the tropics back towards the poles. 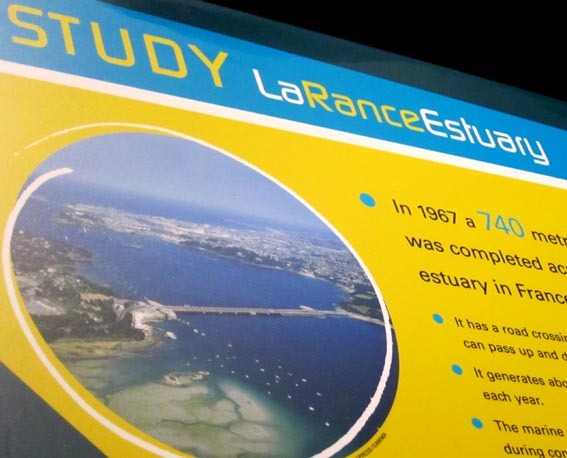 > Temperature differences and changes in salinity (salt content) of the water can also create ocean streams. > As tides rise and fall they can be concentrated in narrow channels between islands to produce fast flowing tidal currents. 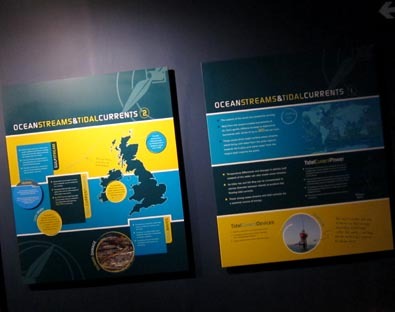 > These strong ocean streams and tidal currents are a potential source of energy. 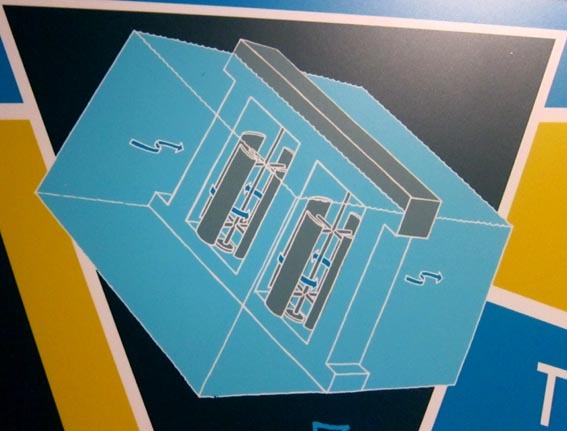 > The energy of fast flowing tidal currents can be converted to useful power using underwater turbines. 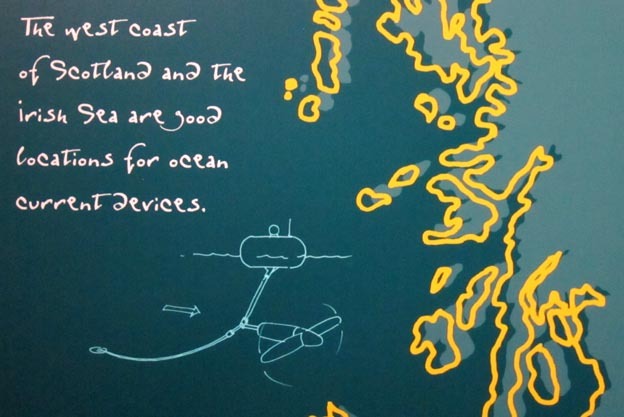 The west coast of Scotland and the Irish Sea are good locations for tidal current devices. > Tidal current turbines are very similar to wind turbines. 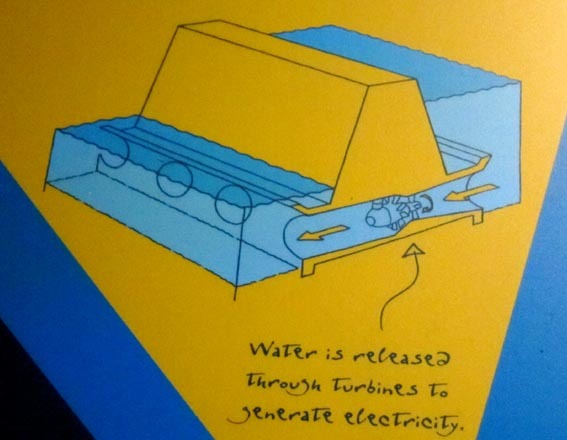 They rotate much slower than wind turbines but they can generate a lot more power because of the greater force of the water. 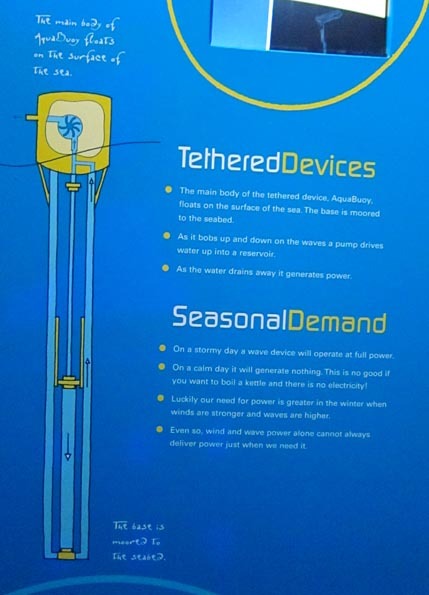 > The turbines are fixed to the sea bed or tethered to fixed floating platforms. They are free to rotate as the current changes direction. 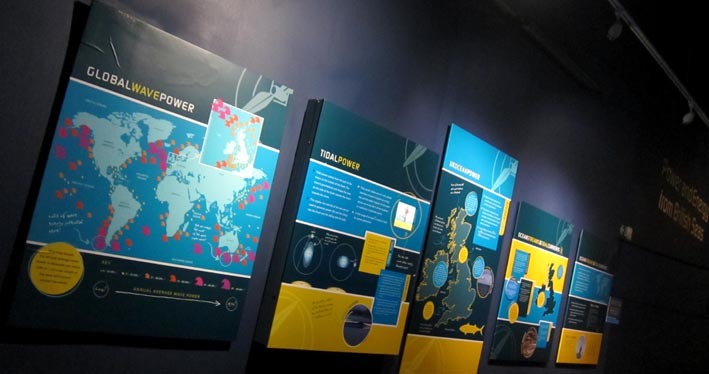 > The environmental impact of ocean tidal power schemes is quite low. 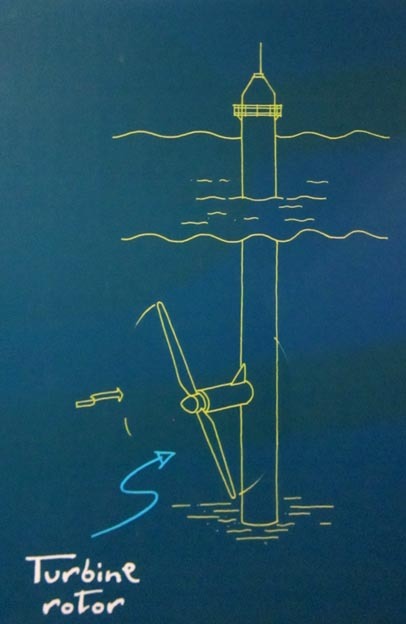 > Seaflow is rather like an underwater wind turbine. 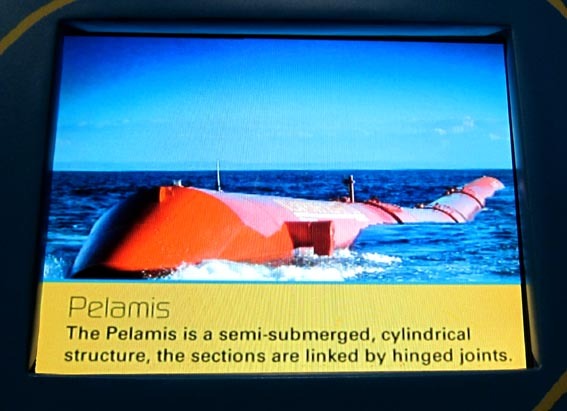 > It uses tidal currents to drive a large underwater rotor which generates electricity. 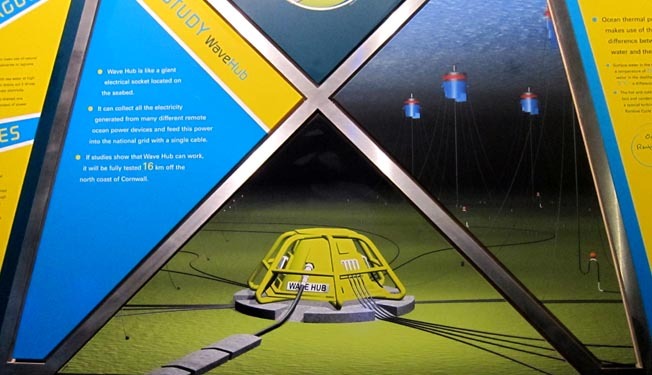 > Seaflow was first tested off the north Devon coast. 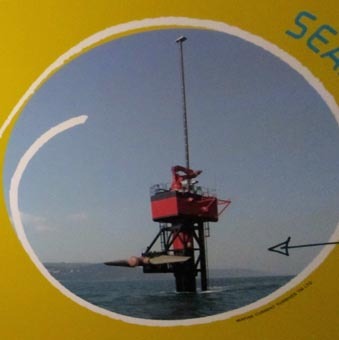 > You can't usually see the turbines as they're busy generating electricity under the water - but they can be raised for access - as shown here. 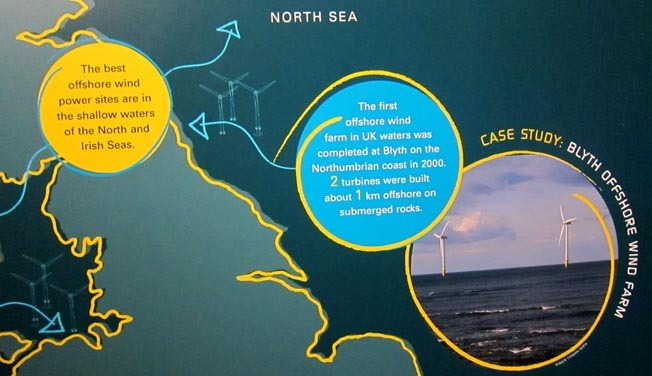 > The tidal current power flowing through the Pentland Firth in Scotland is equal to 6.1 GW. 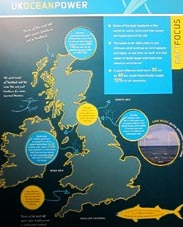 > It is estimated that the tidal current power flowing through the north channel of the Irish Sea is equal to 3.6 GW. > Tsunamis are sometimes called tidal waves, but they are nothing to do with tides. > A tsunami is a type of giant wave caused by underwater earthquakes or volcanic eruptions. > Tsunamis can travel thousands of kilometres and can be very destructive. > The UK is kept warm by a major ocean stream called the Gulf Stream. It brings warm water from the tripics and keeps our climate mild in the winter. > If the Gulf Stream changes course or even stops then the impact on the UK climate will be very great. > Disruption of the ocean streams can also be very bad bad news for plankton, fish and other marine life. 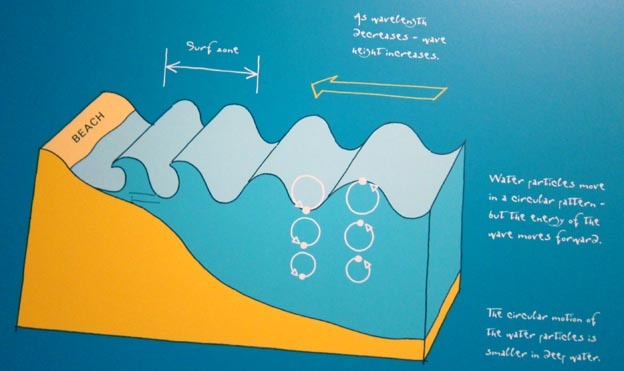 > Ocean tidal current power is a new area of research, but the results are very exciting. 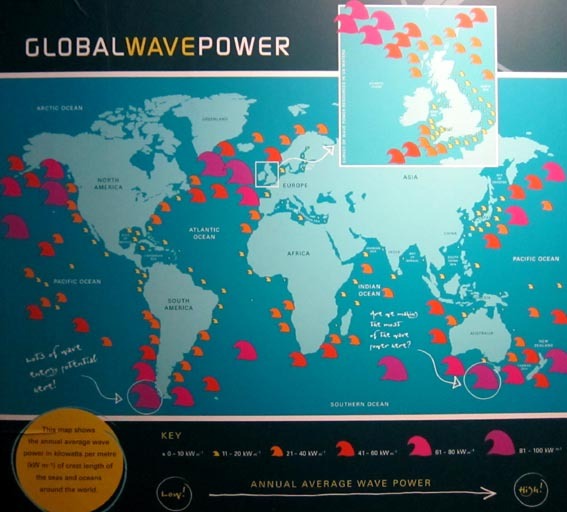 > Scientists think that tidal current power will soon be more important than ocean wave power. 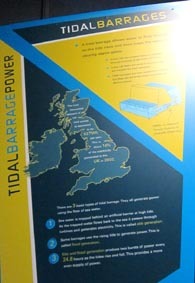 > By 2010 the UK might have tidal current power devices installed in our waters that could generate 322 MW of electricity.